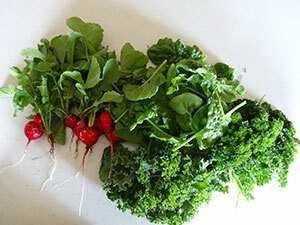 I’ve started harvesting from my garden, and things are growing like crazy! I have to say that my early spring garden suffered from lack of water. Once I turned on my automatic irrigation my garden nearly exploded. 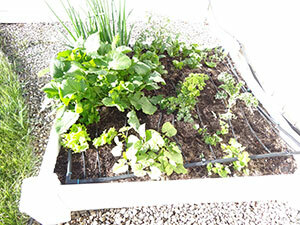 This is my “salad garden”. Unfortunately, I didn’t have any grids and planted this by eye. Now things are growing I can’t really add the grids. 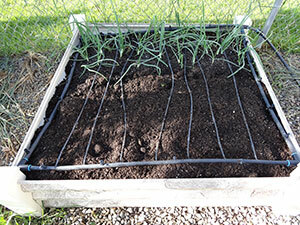 The green onions I planted are done growing, and I will harvest the whole lot of them soon. If you remember, I planted them from the bottoms of some store bought onions. It gave them a huge head start. 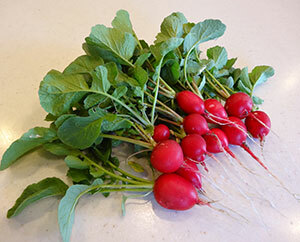 I have harvested all my radishes! Like I said, they grew a little, and then I turned on the sprinklers. 2 weeks later–bam! Honestly, I don’t like radishes, but aren’t they beautiful? The large green patch on the left is turnips. When they were small I thinned them (I had planted 2-3 seeds, and most of them germinated) and harvested the greens for salads and smoothies. Now I’m letting the turnips mature–I hope they will be done soon! 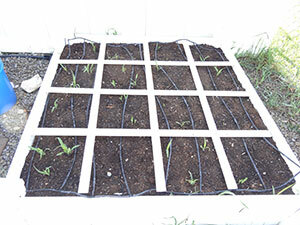 I am growing leaf and head lettuce, peas and beets. However, nearly all of these have been eaten by some bugs. I replanted the peas (hopefully not too late!) and am going to replant the beets as well. The spinach and kale are producing like gangbusters! I go out ever 3 days or so and harvest 2-3 leaves of kale and a bowl of spinach. Harvesting spinach regularly helps it keep growing and producing, and avoids bolting. 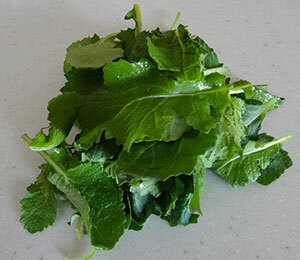 Because the lettuce is still sparse, most of these greens have gone into making smoothies. I’m not complaining, but I am going to plant more lettuce! These pictures represent nearly all I’ve harvested this month. I think I may have gathered another bowl of spinach and 5-6 leaves of kale in addition. All from this 4×4 garden! This is my onions and potatoes. I took out most of the dirt to plant the potatoes, and as they grew I covered them up again. That’s my SFG way of “hilling” the potatoes. Just today I added the last of the dirt. 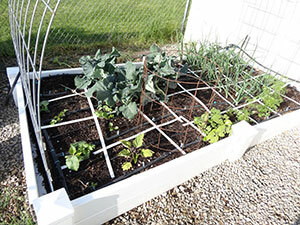 This bed has squash/pumpkins on both ends by the trellis, and they are growing! the top left has broccoli (see photo below), the right is onions. I have cilantro on the bottom right and an eggplant on the bottom left. This spring has been a little cool, and the eggplant is not very happy. I planted zucchini seeds in the small round cage, but so far nothing has grown. Time to replant! With the bright morning light I had to overexpose this so you can see the broccoli head. Woo hoo! 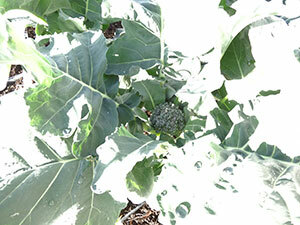 Soon we will be eating fresh broccoli! 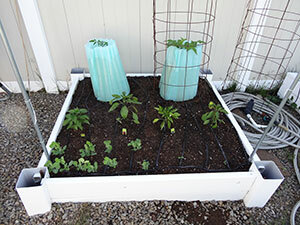 These are tomatoes, peppers, peas and cukes. I used the Walls O Water to protect my tomatoes. A few weeks ago, I removed it from the one on the left. 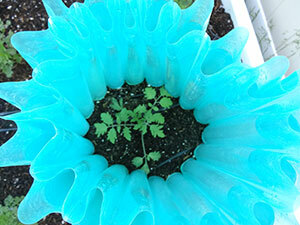 Well, I noticed that it is significantly smaller than the tomato plant that is still protected. So, I put the walls back up! These are the same type of tomato, planted at the same time. The plant on the right is bursting out of the walls, where the plant on the left has barely reached the top. Finally, here’s my bed of corn. Again, some corn did not germinate, so I’m going to replant in hopes that I have a full bed of corn. Amazing! I had GREEN, beautiful corn and a pretty good yield. Corn is a high nitrogen consumer. It not a very easy plant to grow. Needs lots of water and fertilizer. Which type did you plant? What was the finaal results after your replanted it. Great early garden pictures…now that it’s August….I’d love to see how things are going! I loved all my spring lettuce…I wish I could have planted some more for the summer. Gorgeous veggies! Nice work! Just an idea for you: I didn’t like radishes at all until I ROASTED them. Now I can’t get enough. They are a completely different vegetable. (Same with kale. 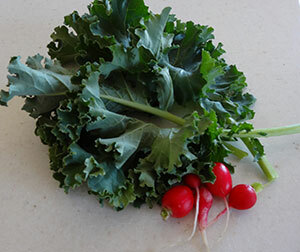 Now I’m a roasted kale chip addict) Just clean the radishes as if to eat fresh, then pour 2 bunches onto a cookie sheet, drizzle about a tbsp of olive oil (or melted coconut oil) add salt & pepper, Use your hands to mix the oil onto the little bulbs; shake the pan so they’re all one layer and roast at 400 for about 15 min. or so. Voila…Utter deliciousness. Looking good! You must be eating well!